The Campaign to Fix the Debt is the latest incarnation of a decades-long effort by former Nixon man turned Wall Street billionaire Pete Peterson to slash earned benefit programs such as Social Security and Medicare under the guise of fixing the nation's "debt problem." Through this special report -- and in partnership with The Nation magazine -- the Center for Media and Democracy exposes the funding, the leaders, the partner groups, and phony state "chapters" of this astroturf supergroup," whose goal is to achieve a grand bargain on austerity by July 4, 2013. The Campaign to Fix the Debt – billionaire Pete Peterson’s Wall Street-backed austerity front group – is scaling down and shedding staff after failing to achieve any of their toxic goals. Their fake youth group, “The Can Kicks Back,” is in debt and about to kick the bucket. They are packing up their phony “can man” and their Mercedes BMW tour mobile (bizarrely called the AmeriVAN) and putting Simpson-Bowles in mothballs. Read our piece on how astroturf got mowed by real people. Since our February 2013 front page expose on this “astroturf supergroup” in the Nation, you helped us spread the word and call out the tax dodging hypocrites with platinum plated pensions pushing harmful budget cuts. Fix the Debt failed because Americans aren’t interested in cutting Social Security or Medicare to offset more tax handouts to big corporations. Now we learn that President Obama has struck “chained CPI” Social Security cuts from his budget proposal. It is time to take advantage of this important victory to pivot to a discussion on how to improve and strengthen these lifesaving programs to preserve them for future generations. Help us continue to be an independent voice in the budget battles. Please consider a generous donation today. Dear WWII Vets, Forget About the Monument, They Are Gunning for Your Social Security! (Photo by Leo Shane III. Used with permission. 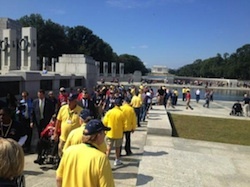 Apparently the only thing both Democrats and Republicans can agree on in Washington, D.C. is that they can't deal with bad press involving Honor Flight vets. This led to absurd images of Republicans -- who had shut down the federal government, including all monuments and museums -- rushing to "aid" veterans shut out by monument closures. In the most revolting display, Rep. Randy Neugebauer (R-CA) publicly berated a National Park Service Ranger for a situation created entirely by Congress. Rev up those engines. It's time for the Honor Vets to head back to Washington to save us all. Read the full article on PRWatch here. Today, the group launched a six figure TV ad buy that reaches new heights of hypocrisy -- and that is saying a lot. This is rich from a group that has been hyping a debt and deficit crisis since its launch in July 2012, even though the deficit has been cut in half in recent years. In January 2013 Fix the Debt steering committee member and former Tennessee Governor Phil Bredesen admitted that Fix the Debt's strategy was to create an "artificial crisis" to achieve a "grand bargain" on Medicare and Social Security. Move over, David Koch and George Soros! Pete Peterson is "the most influential billionaire in America," says the LA Times. Peter G. Peterson has long used his wealth to underwrite numerous organizations and PR campaigns to generate public support for slashing Social Security and Medicare, citing concerns over "unsustainable" federal budget deficits. Full of apocalyptic warnings, Peterson failed to warn of the $8 trillion housing bubble, but conveniently sold his private equity firm Blackstone Group on the eve of the financial crisis. He later pledged to spend $1 billion of the money from the sale to "fix America's key fiscal-sustainability problems," launching the Peter G. Peterson Foundation in 2008. As of 2011, the Huffington Post reported that Peterson had personally given $458 million to the Foundation. Peterson told the Washington Post that he gave Fix the Debt $5 million in funding; Fix the Debt was announced on the Peterson Foundation website and Peterson appeared at the Fix the Debt launch in July 2012. Peterson also funds Fix the Debt parent organization Committee for a Responsible Federal Budget at the New America Foundation. Even before the 2012 Campaign to Fix the Debt, Peterson poured millions into a multifaceted effort to support the Simpson-Bowles Commission and its $4 trillion austerity package, a plan that would cost the nation four million jobs, according to the Economic Policy Institute, and "destroy Social Security as we know it," according to Social Security Works. He bankrolled nineteen "America Speaks" Town Hall meetings, which spectacularly backfired, launched the "OweNo" TV ad campaign, and funded the Concord Coalition’s Fiscal Solutions tour to take the message to the heartland. When the commission blew up -- failing to get the votes needed to advance a plan to Congress -- Peterson gave Bowles and Simpson a new perch at the Committee for a Responsible Federal Budget to allow them to continue to scold Congress. Learn more about Pete Peterson in "Peterson's Long History of Deficit Scaremongering" in The Nation. The deal struck by Congress to avoid a debt default sets up a series of deadlines for a new budget deal and many believe that Social Security and Medicare are in danger. The usually mild mannered Policy Director of the nation's largest union federation sounded the alarm in the strongest terms. Damon Silvers of the AFL-CIO warned Democrats in a Salon interview that "chained CPI" as was proposed in President Obama's budget, would be "fratricide for the Democratic Party." The following is excerpted from a Salon article. On June 13, 2013, the Institute for Policy Studies released a new report, Corporate Pirates of the Caribbean: Pro-Austerity CEOs Seek to Widen Tax Haven Loophole, which shows the billions of dollars Fix the Debt member corporations would stand to gain if Congress agrees to a "Grand Bargain" on the deficit that includes a “territorial” tax system exempting offshore earnings of U.S. firms from U.S. taxation. Two-thirds of the 93 publicly held corporations involved with Fix the Debt were holding profits in offshore subsidiaries at the end of 2012. The 59 firms that reported the amount of these offshore profits had a combined total of more than $544 billion, up from $473 billion in 2011. The average offshore stash per company rose 15 percent in 2012 to $9.4 billion. Currently, these profits are not subject to U.S. corporate income taxes unless they are brought back to the United States (also known as repatriation). If Congress adopts Fix the Debt’s proposed territorial tax system, these 59 companies would stand to win as much as $173 billion in immediate tax windfalls. The biggest potential winner is General Electric, which could reap a tax windfall of as much as $38 billion on its overseas earnings stash of $108 billion. Read the whole article from PRWatch here. With 127 CEOs able to schedule meetings with President Obama and Congressional leaders, numerous PR firms lending a hand, 80 staff, multiple Peterson funded "partner" groups, and 23 phony state chapters, this incarnation of the Peterson message machine must be taken seriously. Fix the Debt documents say the group is targeting a budget of $60 million for the "first phase,"  but in February 2013 Fix the Debt's spokesperson told CMD the organization had only raised $40 million so far. Fix the Debt engaged in a multi-million dollar paid ad campaign in the run-up to the so-called "fiscal cliff" and now is taking that campaign outside the beltway, which is "increasingly resembling a presidential race with grassroots style organizing and offices in places like New Hampshire and Ohio," writes Fortune magazine. As of February 2013, group was touting it 345,000 members/petition signatures. That sounds impressive until one learns that a number of CEOs, such as the CEO of Caterpillar Inc., wrote to 130,000 employees encouraging them to sign and one recalls that their goal was 10 million.Learn more about the firms and the stunts behind the PR spin in the article "Pete Peterson's Puppet Populists" and the Fix the Debt Partners page. Fix the Debt biographies fail to reveal that their core leadership team is riddled with conflicts of interest. Public Accountability Initiative (PAI) points to at least 13 steering committee members with financial ties to firms that lobby on deficit-related matters that are not disclosed in their glossy Fix the Debt bios. These firms lobby to preserve dozens of costly tax breaks (including the “carried interest” tax loophole that made Pete Peterson a rich man) or to hold off new taxes, such as the “Robin Hood Tax,” a proposed financial speculation tax that could raise as much as a $1 trillion over 10 years. Click here to see a chart of these conflicts of interest and tax lobbying records. While Fix the Debt’s 127 CEOs call for cuts to Social Security (a program that does not contribute to the deficit since it is has a surplus and is accounted for outside the federal budget), many of the publicly-traded Fix the Debt firms underfund their employee pension plans by some $103 billion making their employees even more dependent on Social Security. The CEOs, of course, enjoy lavish retirement packages, averaging $9 million each, according to a study by the Institute for Policy Studies. Click here to see a chart of CEO retirement assets vs. underfunded employee pensions (PDF). Many Fix the Debt firms pay a negative tax rate, which contributes greatly to the federal deficit. Worse, Fix the Debt firms are pushing for a "globally competitive" territorial tax system that would increase the debt by $1 trillion over ten years and encourage the offshoring of U.S. jobs, according to Citizens for Tax Justice. This tax cut is not listed in their online goals and rarely spoken of explicitly, but it is mentioned on a slideshow buried on the group's website. The switch would not only add to the deficit, it results in a windfall of some $134 billion dollars for at least 63 Fix the Debt firms, including Google and GE, according to a report by the Institute for Policy Studies. Click here to see a table of 10 top winners from a territorial tax system (PDF). While Fix the Debt targets government programs for the middle class, 38 Fix the Debt leaders are tied to companies with defense contracts totaling $43.4 billion in 2012, as PAI has documented. Boeing (with $25.1 billion in defense contracts) and Northrop Grumman (with $8.5 billion) lead the pack. Boeing CEO W. James McNerney, Jr. is on Fix the Debt’s CEO Council, and Northrop Grumman board member Vic Fazio is on Fix the Debt’s steering committee. Click here to see a chart of the top six defense contractors with Fix the Debt ties (PDF). Fix the Debt biographies consistently fail to expose the financial and lobbying ties of Fix the Debt leaders. You can see a chart of undisclosed financial interests by clicking here or visit our Fix the Debt Leaders page for more detail. UNDISCLOSED CONFLICT OF INTEREST: MacGuineas' husband Robin Brooks is a managing director and a currency trading analyst at Goldman Sachs. Goldman Sachs lobbies around federal tax issues affecting banking and securities and is a member of the Managed Funds Association, which lobbies against efforts to make Wall Street pay its fair share such as the proposed "Robin Hood Tax," a a tiny tax on trades that some economists project could raise $1 trillion over 10 years. Phil Bredesen is the former Democratic Governor of Tennessee and was a superdelegate in the 2008 Democratic presidential nomination. He is a former healthcare industry executive (he founded HealthAmerica Corporation, an insurance company, which he sold in 1986 for about $385 million), and is currently on the board of directors of Vanguard Health Systems, a $5 billion hospital chain, receiving an annual compensation of $240,005 in 2011. Bredesen is on the steering committee of the Campaign to Fix the Debt. In January 2013, Bredesen admitted that Fix the Debt's strategy was to create an "artificial crisis" to achieve a "grand bargain" on Medicare and Social Security. UNDISCLOSED CONFLICT OF INTEREST:Bredesen is currently on the board of directors of Vanguard Health Systems, a $5 billion hospital chain, receiving an annual compensation of $240,005 in 2011. Vanguard lobbied on federal appropriations issues in the third quarter of 2012. Vanguard's biggest owner is the private equity firm Blackstone Group (Blackstone and its affiliates acquired Vanguard in 2004). Blackstone was co-founded by Fix the Debt funder Pete Peterson. Bredesen has been an investor in a number of healthcare companies in addition to HealthAmerica Corp., including Coventry Health Care (which was recently sold to Aetna for $5.6 billion), First Commonwealth, and Qualifacts Systems Inc. For a time Bredesen was being considered for Health and Human Services secretary in the first Obama administration, but lost out to Kathleen Sebelius. Responding to opposition to his potential appointment from national and Tennessee healthcare advocates, Bredesen told the Wall Street Journal "advocacy groups don't matter nearly as much as the pharmaceutical groups, the hospitals, the doctors' groups. There's a lot of very powerful interest groups that will play in this thing." Bredesen is on the Governor's Council of the Bipartisan Policy Center, which received $400,000 from the Peter G. Peterson Foundation in 2011 to fund its Debt Reduction Task Force. In honor of Peterson's many decades of work hyping a nonexistent deficit crisis and neglecting to warn America about real issues, CMD is releasing its own short movie on Peterson and crew along with Pulitzer Prize winning cartoonist Mark Fiore. CMD's Lisa Graves and John Nichols of The Nation speak with Democracy Now! about Pete Peterson's astroturf supergroup "Fix the Debt." Michael Hiltzik, This billionaire is still trying to make you panic about federal debt, L.A. Times, July 29, 2014. Mary Bottari, Dear WWII Vets, Forget About the Monument, They Are Gunning for Your Social Security, PRWatch, October 9, 2013. Sarah Anderson, Scott Klinger, Javier Rojo, Corporate Pirates of the Caribbean, The Institute for Policy Studies, June 12, 2013 . PRWatch.org, Pete Peterson’s “Fix the Debt” Astroturf Supergroup Detailed in New Online Resource from the Publishers of ALECexposed.org, February 21, 2013. Lisa Graves, Pete Peterson's Chorus of Calamity, PRWatch, February 21, 2013. John Nichols, The Austerity Agenda: An Electoral Loser, The Nation, February 21, 2013. Dean Baker, Fix the Debt's Fuzzy Math, The Nation, February 21, 2013. Mary Bottari, Peterson's Puppet Populists, PRWatch, February 21, 2013. The Nation Editorial Board, Stacking the Deck: The Phony 'Fix the Debt' Campaign, The Nation, February 21, 2013. Lisa Graves, Conversation with "Fix the Debt," Help Count the Pinocchios, PRWatch.org, February 28, 2013. Mary Bottari, Guess Who's Coming to Dinner? Fix the Debt, PRWatch.org, February 28, 2013. The New York Times, Jared Bernstein and Dean Baker, Taking Aim at the Wrong Deficit, November 6, 2013. Los Angeles Times, Michael Hiltzik, Another completely bogus poll on the national debt, October 29, 2013. Slate, Matthew Yglesias, Fix The Debt Applauds Hostage Tactics, October 7, 2013. LA Times, Michael Hiltzik, The chained CPI: A zombie benefit cut still walks, October 4, 2013. New York Magazine, Kevin Roose, Why Doesn’t Fix the Debt Try to Do Something About the Debt Ceiling?, October 3, 2013. Los Angeles Times, Michael Hiltzik, False equivalency from Fix the Debt, October 2, 2013. National Journal, Chris Frates, Fiscal Fights Looming, Can Simpson-Bowles Group Get Congress to Move?, August 27, 2013. Nonprofit Quarterly , Rick Cohen, Pay No Corporate Taxes: GE and Other Corporations Line Up Behind “Fix the Debt”, August 26, 2013. Other Words, Scott Klinger, It’s Time Corporations Flew Old Glory Instead of the Jolly Roger, June 12, 2013. Morning Sentinel, Sarah Anderson, Taxpayers subsidize CEO salaries with 'performance pay' loophole, May 19, 2013. Huffington Post, Michele Swenson, Pete Peterson's Fix the Debt CEOs Promote Austerity for the Masses, Expanding Wealth for the 1 Percent, May 21, 2013. The Dalles Chronicle, Sam Pizzigati, How We Pay For Ceo ‘Performance’, May 14, 2013. Teamster Nation, Meet the greedy billionaire who wants to destroy Social Security, April 8, 2013. Democracy Now!, Billionaires for Austerity: With Cuts Looming, Wall Street Roots of "Fix the Debt" Campaign Exposed, February 26, 2013. New York Times, Thomas Edsall, The War on Entitlements, March 6, 2103. Bloomberg Businessweek, Joshua Green, Why Won't Americans Listen to Alan Simpson and Erskine Bowles, February 28, 2013. Huffington Post, Dean Baker, Macho Men, Social Security, and Chained CPI, February 25, 2013. Washington Post, Ezra Klein, The Problem with Alan Simpson, "Wonkblog," February 20, 2013. 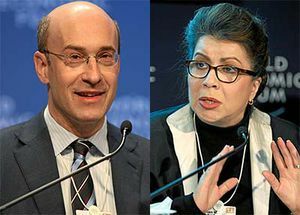 Fix the Debt leader Maya MacGuineas, Honeywell CEO David Cote, financier Steven Rattner (who was banned from the securities industry for his involvement in a pension-fund kickback scheme) and other CEOs ring the bell on the New York Stock Exchange. The Can Kicks Back -- with its foam "AmeriCAN" character -- is one of many efforts to convince the public that young people care more about the national debt than their own. Fix the Debt leaders talk about the group as if it "popped up" out of nowhere, but it apparently popped up in the Fix the Debt offices, where it shares space with Maya MacGuineas' Committee for a Responsible Federal Budget. Pete Peterson has given at least $5 million to Fix the Debt, according to the Washington Post. Fix the Debt is listed as a project of the Committee for a Responsible Federal Budget (CRFB) on CRFB's website. Peterson has long funded CRFB and served on its board. CRFB is itself a project of the New America Foundation (NAF). In the 1990s, CRFB partnered with tobacco firms, anxious to avoid higher excise taxes on cigarettes, to tank the Clinton health care plan. Today, critics claim CRFB is a "Trojan Horse" for a similar agenda to cut taxes for wealthy corporations who want to create a territorial tax system. Concord Coalition: $6,036,060 (including $1,500,000 in matching funds). With regard to Fix the Debt and its many partner organizations, the National Journal observed: "Singlehandedly, Peterson has created a loose network of deficit hawk organizations that seem independent but that all spout the Peterson-sanctioned message of a 'grand bargain.'" Fix the Debt CEOs say they are worried about the debt and deficits, yet many Fix the Debt firms pay a negative tax rate or a tax rate well below the standard 35 percent -- adding greatly to our nation’s deficit. Fix the Debt CEOs say that what is needed to balance the books is cuts to earned benefit programs like Social Security (which is a separate federal program not counted in the federal budget at all). At the same time, many of these same CEOs under-fund their employee pension plans, making it likely that their workers will be even more dependent on Social Security. This hypocrisy has led to a campaign called "Flip the Debt," which calls upon major corporations to pay their fair share of taxes. ↑ Campaign to Fix the Debt, CEO Talking Points 10/2/12, organizational document, October 2, 2012. ↑ Ryan Grim and Paul Blumenthal, Peter Peterson Spent Nearly Half A Billion In Washington Targeting Social Security, Medicare, Huffington Post, May 15, 2012. ↑ Suzy Khimm, How Fix the Debt is coping with its 'fiscal cliff' setback, Washington Post, January 11, 2013. ↑ Peter G. Peterson Foundation, Civic Leaders, CEOs and Budget Experts Gather to Announce Launch of The Campaign to Fix the Debt, organizational website under "Projects and Grants," July 17, 2012. ↑ New America Foundation, Launch of the Fix the Debt Campaign: July 17th, 2012 - National Press Club, youtube page, July 19, 2012. ↑ Josh Bivens and Andrew Fieldhouse, Fiscal commissioners' proposal would cost millions of jobs, Economic Policy Institute, November 16, 2010. 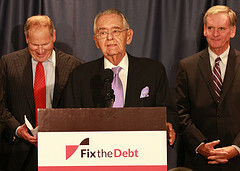 ↑ Virgil Dickson, "Burson's Proof unit launches Fix the Debt ad campaign", PR Week, November 16, 2012. ↑ 10.0 10.1 Anne VanderMey, "Fix the Debt isn't going anywhere", Fortune, January 30, 2012. ↑ 14.0 14.1 Citizens for Tax Justice, Why Congress Should Reject A “Territorial” System and a “Repatriation” Amnesty: Both Proposals Would Remove Taxes on Corporations’ Offshore Profits, fact sheet, October 19, 2011. ↑ Institute for Policy Studies, A Pension Deficit Disorder: The Massive CEO Retirement Funds and Underfunded Worker Pensions at Firms Pushing Social Security Cuts, organizational report, November 21, 2013. ↑ Institute for Policy Studies, The CEO Campaign to ‘Fix’ the Debt: A Trojan Horse for Massive Corporate Tax Breaks, organizational report, November 13, 2013. ↑ Public Accountability Initiative, Operation Fiscal Bluff, organizational report, December 19, 2012. ↑ New America Foundation, Testimony of Maya MacGuineas, organizational document, testimony from the President's Commission to Strengthen Social Security on October 18, 2001. ↑ Vanguard Health Systems, "Bredesen Biography", organizational website, accessed January 1, 2013. ↑ Kevin Rector, "Coventry Health Care To Pay $3 Million To Avoid Prosecution in Medicare Case", The Hartford Courant, November 21, 2012. ↑ Laura Meckler, HHS Candidate Draws Fire, Fights Back", The Wall Street Journal, February 10, 2009. 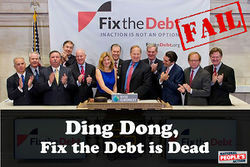 ↑ Paul Blumenthal and Christina Wilkie, Fix The Debt Campaign's Bipartisan Veneer Masks Conservative Backing, Huffington Post, December 3, 2012. ↑ Committee for a Responsible Federal Budget, CRFB, organizational website, accessed January 2013. ↑ Institute for Policy Studies, The CEO Campaign to ‘Fix’ the Debt: A Trojan Horse for Massive Corporate Tax Breaks, organizational report, November 13, 2012. 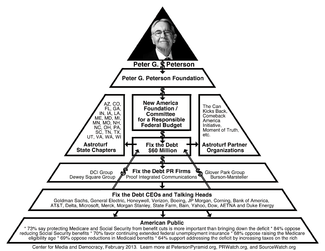 ↑ 42.0 42.1 Peter G. Peterson Foundation, New America Foundation/Committee for a Responsible Federal Budget, organizational website, accessed January 2013. ↑ Peter G. Peterson Foundation, Comeback America Initiative, organizational website, accessed January 2013. ↑ Peter G. Peterson Foundation, Committee for Economic Development, organizational website, accessed January 2013. 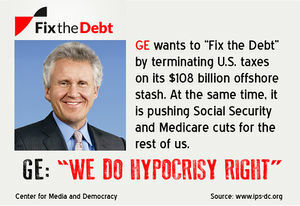 ↑ Nancy Cook, Billionaire Peterson Sounds Alarm on Deficit, National Journal, November 26, 2012. NB: CAP received half a million dollars from the Peterson Foundation in 2011. ↑ Honeywell, "2011 Annual Report", organizational report. ↑ 48.00 48.01 48.02 48.03 48.04 48.05 48.06 48.07 48.08 48.09 48.10 Institute for Policy Studies, "A Pension Deficit Disorder: The Massive CEO Retirement Funds and Underfunded Worker Pensions at Firms Pushing Social Security Cuts", organizational report, November 21, 2013. ↑ 49.0 49.1 49.2 49.3 49.4 Citizens for Tax Justice, data compiled by CTJ, on file with CMD. ↑ General Electric, "2011 10K Form", organizational document, page 27. ↑ Verizon, "2011 Annual Report", organizational document, page 25. ↑ Corning, "2011 Annual Report", organizational report, page 63. ↑ Merck, "2011 10K", organizational document, page 41. ↑ Delta Air Lines, "2011 Annual Report", organizational document, page 24. This page was last edited on 21 May 2015, at 18:09.